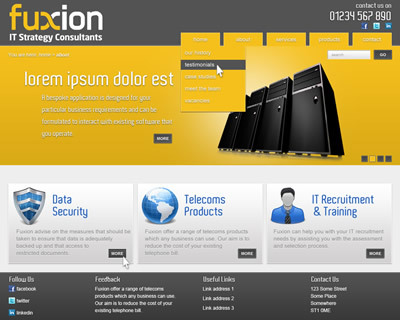 Fuxion.co.uk needed a new site layout. 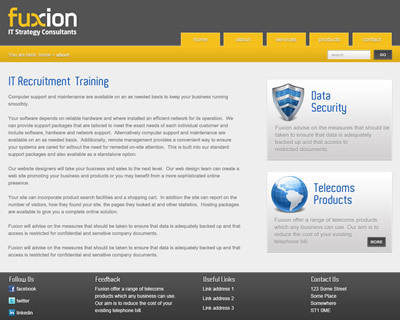 Something more modern and contemporary, but also geared towards a corporate customer base. I created a design that decluttered their home page completely, focusing on just three main areas of their services. This allowed the home page to free up lots of available space for a jQuery banner area, which can be used dynamically to show the latest point of focus for Fuxion. With the inner pages, the banner is replaced with a smaller area, which lifts the content area towards to the top of user’s browsers. The system also includes several enhancements to user’s browsing, including caching of common elements (which speeds up the loading time of pages) and the latest CSS3 gradients and shadows for modern browsers (which reduces the load time for images further). 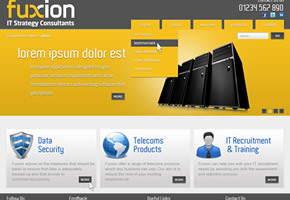 The result is a quick, lightweight site, with full CMS integration for content control. Danny was excellent from the start. His initial bid made it very clear what he would deliver, how and when. His portfolio demonstrated his creativity superbly. Put these together and I awarded Danny the work. During the design process Danny asked relevant questions to ensure the design would be suitable and he also listened to my own input to make sure what I wanted. Once a design was chosen Danny produced the necessary HTML files and offered guidance on there use. I make no hesitation in recommending Danny to anyone. He is a pleasure to work and extremely talented and good at what he does!